I've just come from seeing the 2015 edition of the Andy Williams Christmas Show; all I can say is, "WOW!" 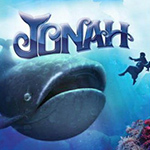 It's a spectacular, unique, and magical Christmas production that is as beautiful and inspiring as it is entertaining, exciting, and fun. Recently, during separate interviews with Jimmy Osmond and the Lennon Sisters, they expressed what an honor it was to remember and honor Andy Williams by continuing his style of Christmas show. From the very first number, to the last, the show is a variety of music, dancing, color, magic, and more, moving from element to element as I eagerly awaited what was coming next. Read entire article here. Christmas in Branson starting at less than $200? You bet! For as low as $189, you can get two nights of comfort at the Dutton Inn or Scenic Hills Inn, and tickets to the fabulous holiday show, Christmas in Wonderland! Your affordable package also includes a visit to the dazzling new drive-thru, Ozark Mountain Christmas Lights & Village, and a Branson Guest Card Savings Book. Add another night and enjoy the delightful Dixie Stampede; it's an extra special treat at Christmas time! It's "All About Christmas," so get away to Branson now! View package here. 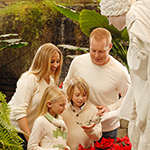 "The Butterfly Palace & Rainforest Adventure's White Flight provides Branson with a unique 'White Christmas,'" said Annette Wood, Director of Sales and Marketing for the Branson Tourism Center "Like Silver Dollar City's Old Time Christmas, Branson's live Christmas Shows, and much more, it's yet another unique Branson Attraction that makes Christmas in Branson so special," she added. Read entire article here. 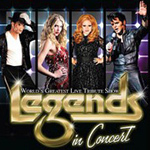 "Branson is known for the quality and variety of its live shows, attractions and other exciting activities," said Annette Wood, Director of Sales and Marketing for the Branson Tourism Center. 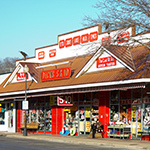 "In addition, it's a fabulous shopping destination offering an unparalleled shopping adventure at its hundreds of different national chain stores, boutiques, flea markets, craft malls, famous-name outlet stores, and specialty shops," she added. 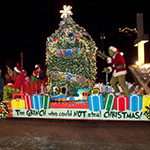 "In terms of the traditional American Christmas, no other major travel destination celebrates the holiday and honors the real reason for the season like Branson, Missouri," said Annette Wood, Director of Sales and Marketing for the Branson Tourism Center, one of Branson's largest and most respected vacation planning services. "It is a consistent theme in Branson shows, Silver Dollar City's Old Time Christmas, and many other area attractions and activities, but keeping Christ in Christmas is the absolute focal point of Branson's 67th 'Adoration Parade and Lighting Ceremony,'" she continued. Read entire article here. In what might well have been one of the greatest Christmas entertainment gifts ever, Lawrence Welk introduced the four lovely and talented Lennon Sisters to America during his national TV show on Christmas Eve of 1955. 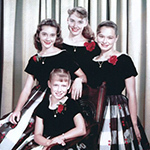 America fell in love with them and now, 60 years later, 'America's Sweethearts' are still entertaining, thrilling, and inspiring audiences with their one-of-a-kind vocal sound and personality. Read entire article here. Branson Up Close and Personal with Dana Parker, the 5th member of the Million Dollar Quartet! 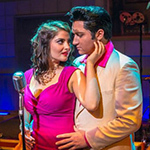 Branson's newest hit show, Million Dollar Quartet, brings a legendary night to the Branson stage in a show that combines music everyone already knows with a great story, creating a one of a kind entertainment experience. It's based on one of the greatest jam sessions in rock n' roll history; an impromptu gathering of four young recording legends-to-be: Carl Perkins, Elvis Presley, Johnny Cash, and Jerry Lee Lewis, that took place on December 4, 1956 in the Memphis storefront recording studio of Sun Records. Read entire article here. 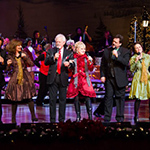 Five things you really need to know about having a fabulous Christmas Week in Branson! "Branson is famous for its live entertainment, attractions, shopping, fun, and other exciting activities," said Annette Wood, the Director of Sales and Marketing for the Branson Tourism Center. "Christmas Week, the week between Christmas and New Year's Day, is filled with all the things that Branson is famous for...and then some," she continued. Read entire article here. How many of these amazing December 2015 Branson highlights would you like to see? "The highlight of December in Branson is Christmas," said Annette Wood, the Director of Sales and Marketing for the Branson Tourism Center. "From its fun, excitement, and entertainment to the celebration of the real reason for the season, Christmas in Branson is special and unique," she added. Wood points out that many of Branson's most popular shows, and the majority of its attractions, shopping, and other activities, are open throughout the Christmas season. Read entire article here.